When native Rockingham County caver and biologist Pete Barlow first went to Breathing Cave in Bath County, Va., as a youth, the one thing he remembered, more than the elaborate passageways and 40-foot canyon walls and vaulted chambers, was the thousands of bats looking on from above. “There were so many, we’d sometimes put a few bats in a Cheez-It box and release them in the gym to freak the girls out,” Barlow recalls. Today, of course, Barlow would never dream of plucking a bat from her roost, let alone shoving her in a box and releasing her into a gym full of equally mischievous teens. But now, he says, even if he wanted to catch a bat in Breathing Cave, he’d be hard-pressed to find one. Since WNS was first discovered in New York during the winter of 2006, it has now spread to 29 states and five Canadian provinces. Some estimate more than seven million bats, primarily Indiana, northern long-eared, little brown, and tri colored bats, have perished due to the fungus. In many caves throughout the East, mortality rates are up to 95 percent. Take Black Diamond Tunnel in Rabun County, Ga., for example. In 2013, the tunnel served as the hibernacula, or winter hibernation grounds, for 5,517 tri-colored bats. The colony was thought to be the largest in the state. Now, only 220 tri-colored bats remain. Cornelison is hoping his research on the bacteria Rhodococcus rhodochrous will be one of those tools. The bacteria originally proved useful in its ability to delay the ripening of fruit. But when Cornelison learned that the fruit responded without ever coming into direct contact with the bacteria, they need only share the same air-space, and that exposed fruit showed significantly fewer amounts of mold, the lightbulb went off. Could this same bacteria save our bats? “It’s still very much in the developmental phase, but we have several field trials planned for this coming winter,” he says. In effect, Cornelison and his team will be installing bacteria misters in caves, small devices not unlike those time-release air fresheners you see at the store. The idea is that hibernating bats exposed to mists of the mold-resistant bacteria will be spared the fatal effects of Pseudogymnoascus destructans, the fungus responsible for white-nose. If bats can remain fungus-free during hibernation, when their immune systems are down, they may stand a chance of enduring and, eventually, recovering their numbers. Sounds easy, and in a lab, where every variable can be controlled, it certainly has the appearances of being a successful treatment. But what is the effectiveness of Rhodococcus rhodochrous on a larger scale? Will it damage other characteristics of caves or species that reside in them? The answers to those questions, Cornelison says, will only come with time. Considering bats normally produce just one pup per year, and that WNS has now spread as far west as Washington state, time is something these mammals can’t afford. With increasing disturbances from timber harvesting and wind turbines, too, bats have a lot working against them. Bats are important in pollination, sure, and eat what many say equates to their body weight in insects every night. By some reports, the loss of seven million bats could equate to one billion dollars lost on, essentially, free predation of pests, which means farmers will need to start spending more on pesticide, and consumers more at the grocery store. “We can’t afford to lose all of the bats out of the ecosystem,” says Dennis Krusac, Endangered Species Specialist for the Forest Service’s Southern Region. More importantly, adds Krusac, we can’t afford to be part of the problem. WNS is proving to be one of the deadliest wildlife diseases in history. Once scientific evidence showed humans, specifically cavers, were capable of transporting the fungal spores responsible for WNS, the Forest Service had to act. In 2009, select caves and underground mines on Forest Service property were gated. Five years later, the Forest Service signed a blanket memo that restricted recreational access to all of its caves in the South. The closure, which will remain in effect until 2019, was controversial, exacting, and according to Krusac, 100 percent necessary. Bats are social animals and migrate between their winter hibernacula and summer maternity sites, says Krusac, so bats will inherently spread WNS amongst themselves. But leaps of 450 miles, and most recently 1,800 miles from Minnesota to Washington state? “If I was a betting person, I would bet that [the discovery of WNS in Washington] was a human-caused transmission,” says Krusac. Cavers in the community balked at the closure. Caves, they said, needed the protection of the caving community. In 2009, five years before the official Forest Service blanket closure, the National Speleological Society (NSS) had enacted a voluntary moratorium on caving only to see instances of cave graffiti and littering increase. If anyone should be allowed underground, they argued, it should be cavers. In some ways, Krusac agrees. That’s why, he says, legitimate cavers weren’t altogether banned from entering caves. In fact, in all of the closures since 2009, the Forest Service has explicitly stated that “persons with written authorization by a Forest Service Officer” could enter caves, so long as the cavers were assisting in “cave resources management”—activities such as cave mapping, white-nose syndrome surveys, bat monitoring, water quality monitoring, and biological inventories. Still, says Krusac, it’s impossible to limit access to caves altogether—the Forest Service ban only addresses caves and underground mines on Forest Service property which, in the Southeast especially, amounts to a very small percentage. Most caves are still on private property, which means access is left up to the landowner. Krusac doesn’t encourage newcomers to the sport, especially during this extremely sensitive time, but he suggests getting involved with cave conservation grottos if people are genuinely interested in protecting and advocating for these resources. James River Grotto’s Education Coordinator Ken Mays, or “Gizmo,” as most people in the caving community know him, recognizes the need for this citizen science research. A number of his fellow cavers became part of a Smithsonian research team back in 2009, the year when Gizmo and many others throughout the region simply quit caving out of respect of the NSS voluntary moratorium. Gizmo started recreationally caving again in 2011. He doesn’t take WNS lightly and follows all of the necessary steps in decontamination, but says that there’s another problem the caving community should be addressing, and it has nothing and everything to do with bats. “When I joined the James River Grotto in 2008, I was the youngest member at 42,” says Gizmo. “A lot of the grottos are getting older.” Gizmo worries that if the older generation of cavers dies off without a younger group to step in, who will be the voice for caves and the species therein? “The education of people about caves and bats by introducing them to caving is, in my opinion, crucial to saving [them],” he says. There is still a lot to learn. 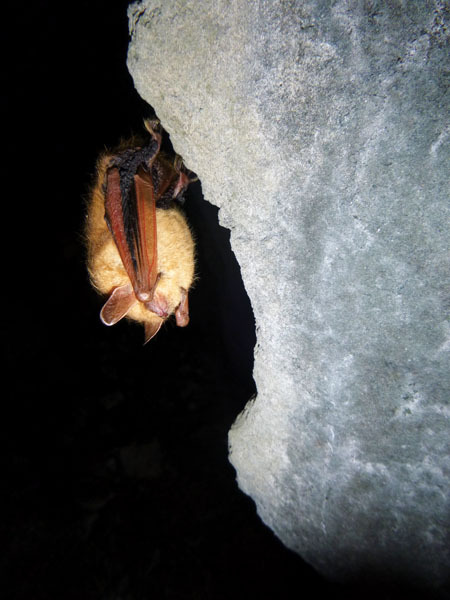 As climate change continues to alter the environment, caves that once might not have supported any bat populations may be deemed suitable sites for hibernation in the future, which makes protecting them now from WNS and any other invasive more important than ever. Back in Rockingham County, Pete Barlow believes protecting endangered bats deserves priority over recreation needs. Still, he recognizes that responsible caving can help with scientific research and public awareness. “We need an experiential appreciation of caves in order to know what we are protecting,” he says.